Dreaming of a cozy bedroom? Would you like to create a modern interior in keeping with the decor trends of 2019? To help you achieve your dream, we invite you to discover our 20 ideas for transforming the bedroom into a cozy little cocoon. Succeeding the development of a cozy bedroom can be summed up in a few words: create a haven of peace conducive to relaxation. 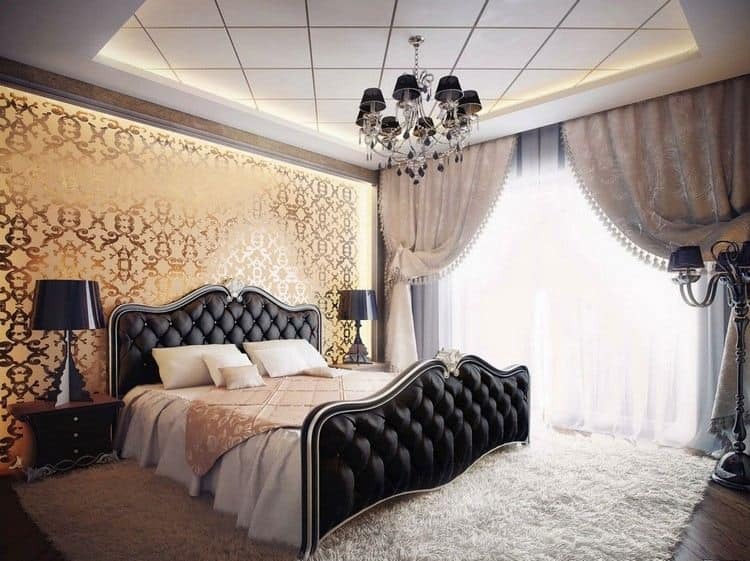 What if your cozy bedroom took on an ultra-glamorous look? 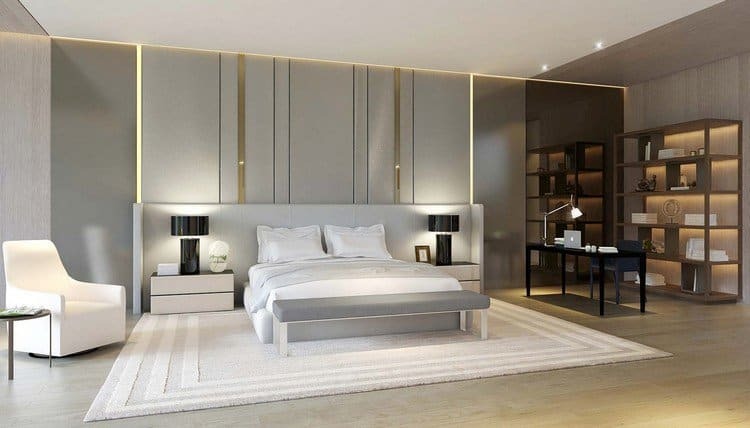 So, discover the 2019 decor trends and warm up the atmosphere of your bedroom with our precious tips! 1 Take inspiration from our photo gallery to successfully create a cozy bedroom according to the decorating trends of 2019! 2 Cozy bedroom in a jiffy – clever ideas and practical advice! 3 The cozy bedroom advocates the use of warm colors and soft materials! 4 Turn the cozy bedroom into a cozy cocoon! 5 Cozy bedroom – discover our favorites! 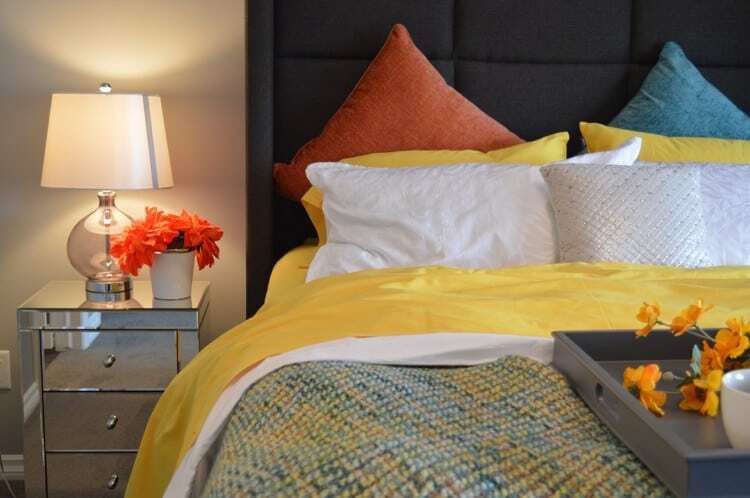 7 Multicolored accessories with geometric patterns to brighten the decor of the cozy bedroom! 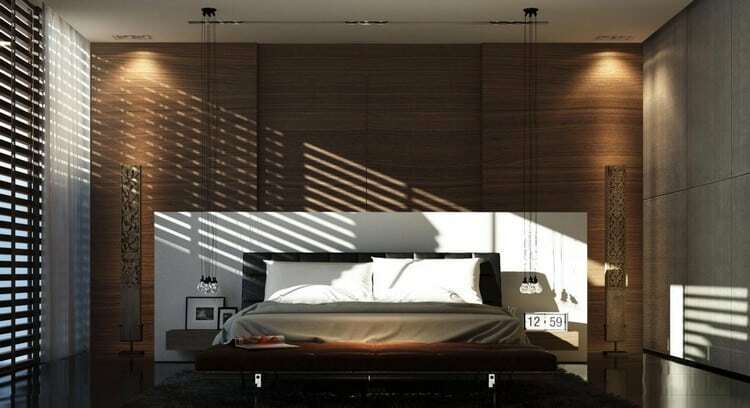 10 Design bed with clean lines and integrated dressing to optimize the space in the cozy bedroom! 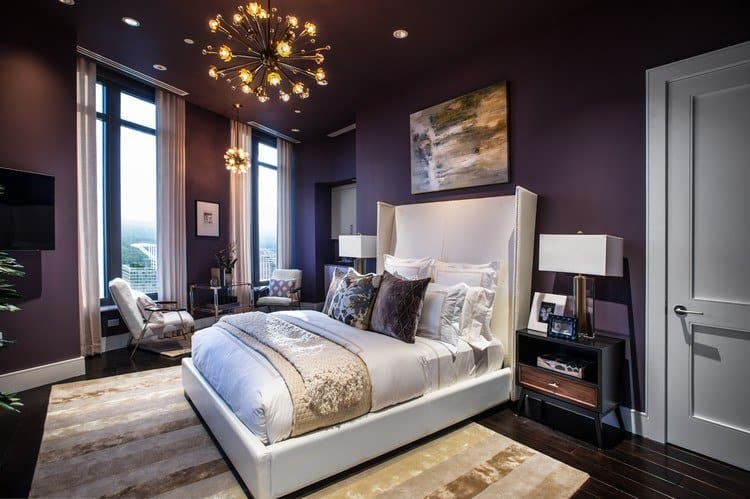 12 Purple bedding, assorted designer poufs and shaggy gray taupe carpets to magnify the cozy bedroom! 13 Spacious and bright, this cozy bedroom amazes us with its seaside decor! 16 Original oriental style paintings and elegant furniture for a cozy Asian-style bedroom! 19 Store your clothes by color from light to dark! 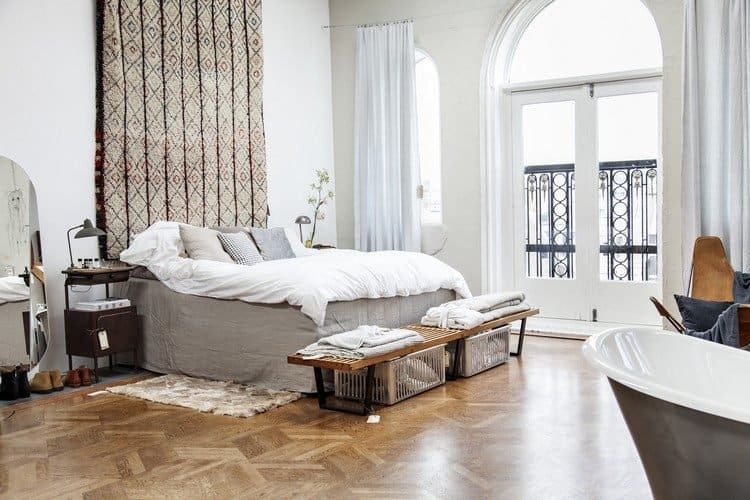 Take inspiration from our photo gallery to successfully create a cozy bedroom according to the decorating trends of 2019! What are the current trends in interior design? How to proceed to create a cozy bedroom? Instead of answering all these questions, Indecortrends suggests you take a look at the photo gallery below. What more can you say? Well, know that we have concocted a superb recipe that holds you full of unexpected surprises. Cozy bedroom in a jiffy – clever ideas and practical advice! The cozy bedroom of modern spirit rhymes with sobriety and elegance. With a simple and refined look, it is more and more practical and functional. To enhance its cozy and warm appearance, we advise you to pay close attention to decorative accessories: curtains, rugs, paintings, soft cushions, plaids and etc. The cozy bedroom advocates the use of warm colors and soft materials! What is the most effective way to create a cozy bedroom according to the canons of interior design? If you want to transform your bedroom into a place of relaxation, you must choose a beautiful soft lighting. 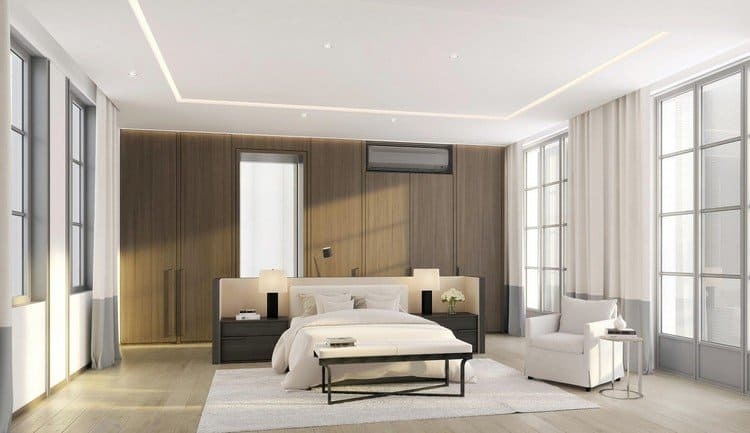 Whether you add LED spotlights to your ceiling or a beautiful original suspension, discreet lighting is undoubtedly the best way to sublimate your cozy bedroom! Turn the cozy bedroom into a cozy cocoon! To warm up the interior of the cozy bedroom, we prefer soft textures and noble materials such as solid wood, blond stone, brick and etc. We mix the so-called “hot” colors and we play with the elements of Deco. If you’re a fan of earthy nuances, you can give your imagination free rein: even the most daring mixes are allowed, as long as you stay in the same color range. Cozy bedroom – discover our favorites! If you do not have enough bedroom in the cozy bedroom, we encourage you to focus on compact furniture that will not clutter the space. 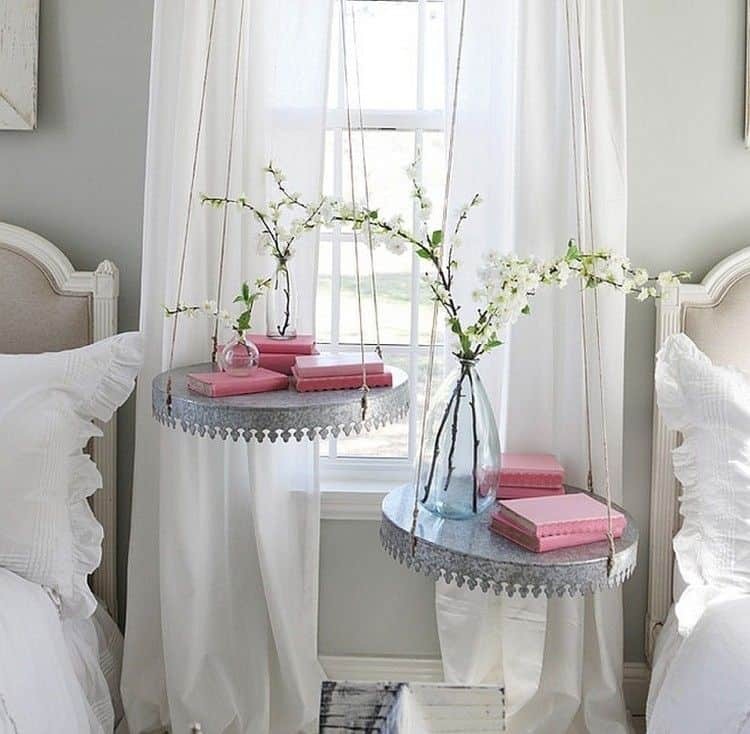 To visually enlarge the bedroom, you can also dress your walls in a pastel color: beige sand, cream, ivory and etc. To sublimate the interior of the cozy bedroom, we do not hesitate to put an accent on the decorative accessories ! We cover the mus of a multitude of multicolored paintings to spice up the atmosphere, and we hang thick curtains to reinforce the cozy aspect of the bedroom. 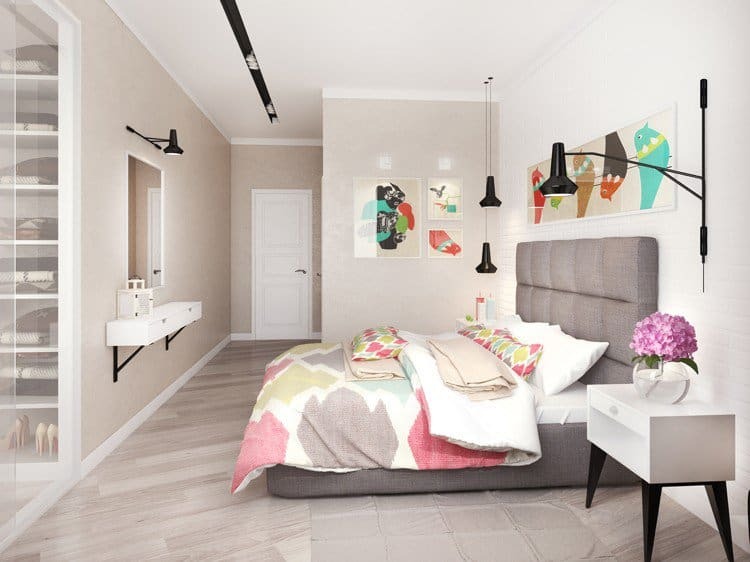 Multicolored accessories with geometric patterns to brighten the decor of the cozy bedroom! As you probably know, the gray color has become a real star in deco! Synonymous with chic and elegance, it invites itself in our homes to magnify the interior of all living bedrooms, including the cozy bedroom! In small touches or total look, the gray suits all styles of decor to bring modernity and sophistication to the contemporary interior. 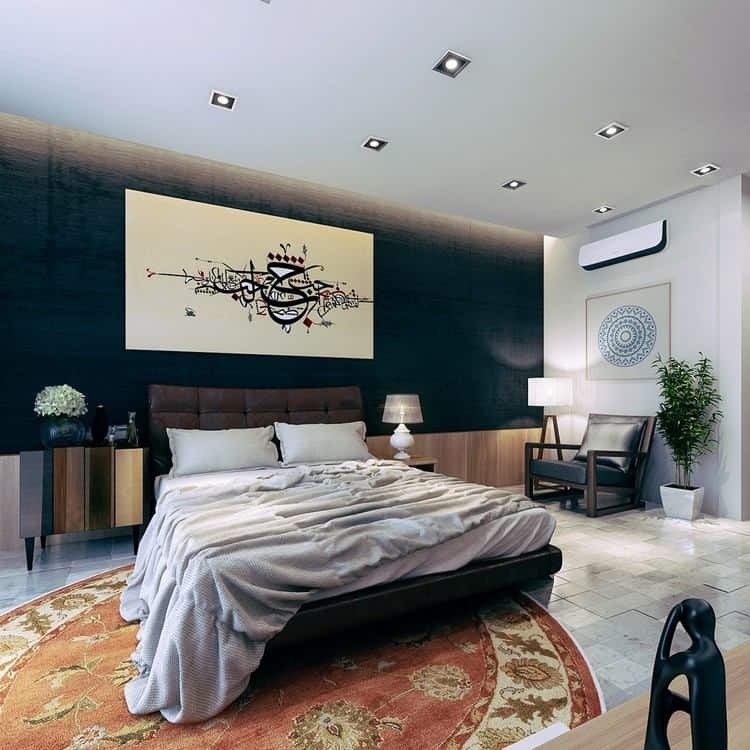 Above another example that will help you create a cozy bedroom according to the decor trends 2019! We love the softness of the gray-brown duo that characterizes this contemporary bedroom. We appreciate the clean lines of the design furniture and the discreet lighting that creates a cozy atmosphere, and a feeling of fluidity that hovers in the air. 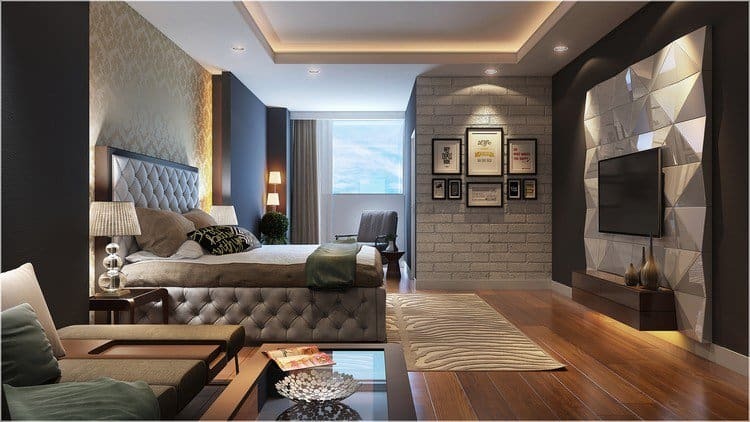 Succumb to the charm of this cozy bedroom that seduces us with its sophisticated elegance and refined look! Here, modern spirit and merry decor go hand in hand to create a typical aesthetic harmony of the minimalist style. The centerpiece in the bedroom is the large red chalkboard that boosts the decor of the bedroom with its daring look. 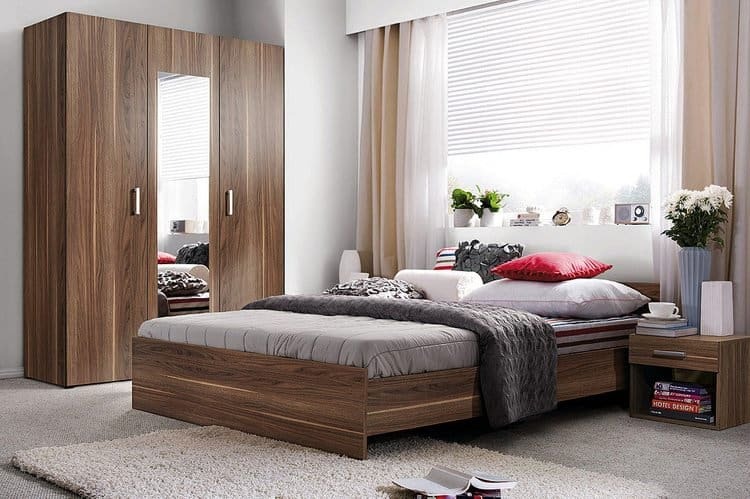 Design bed with clean lines and integrated dressing to optimize the space in the cozy bedroom! 100% serene atmosphere and clean decor are the main features of this beautiful cozy bedroom. Modern and friendly, this pretty bedroom is cozy thanks to the presence of solid wood that adorns the ceiling and the wall behind the bed. We immerse ourselves in a zen atmosphere created by the LED lighting integrated into the modern ceiling and the large panoramic windows that filter the daylight. To transform the cozy bedroom into a splendid luxury bedroom, it is necessary to avoid at all costs the omnipresence of the sterile colors. If you are lacking in inspiration, we invite you to consider the example above. We suggest you paint your walls in an intense color, such as purple and chocolate brown, and opt for a floor covering with the same color. What better than to bet on oak or solid mahogany parquet! If you do not want to take the lead with the cleaning products, we advise you to choose a flooring as aesthetic as the dark floor, but much less difficult to maintain! Floating parquet and imitation solid wood tiles will do the job! 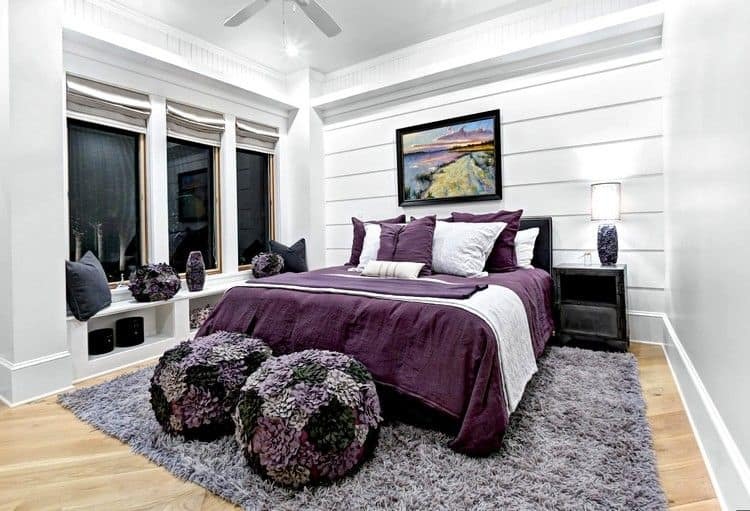 Purple bedding, assorted designer poufs and shaggy gray taupe carpets to magnify the cozy bedroom! 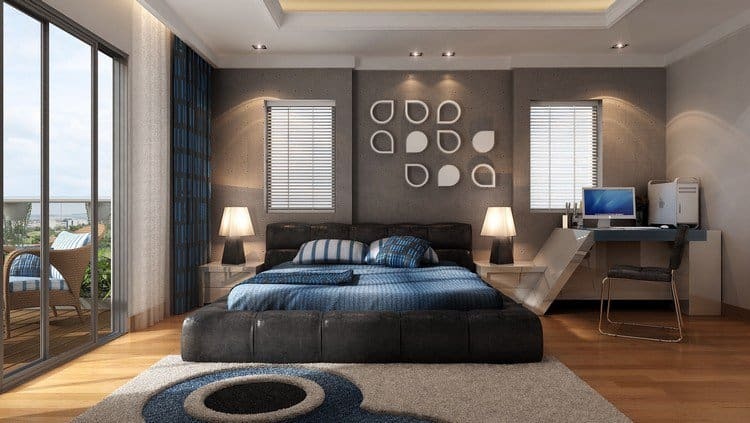 In the cozy bedroom, the atmosphere is warmed by the presence of a comfortable bed! The cozy bed is undoubtedly the star piece in a warm bedroom. To transform your bed into a soft cocoon, Indecortrends suggests you to use a lot of decorative accessories. You can sprinkle the cover with a multitude of cushions made in a voluptuous fabric. Do not hesitate to adorn the floor of some soft poufs and a shaggy carpet, as the example above. 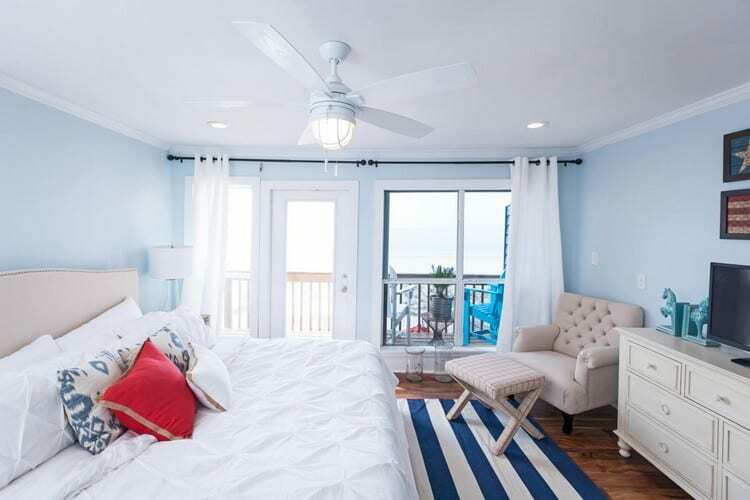 Spacious and bright, this cozy bedroom amazes us with its seaside decor! Create a cozy bedroom in a jiffy, is it possible? Yes! Just replace old decorative items with new accessories full of life! Side walls, you can hang a fairy curtain that will recall the romantic sweetness of the vagueness of the Mediterranean. As for the floor, we put on a beautiful striped rug in white and blue to complete the spirit of the seaside! At once elegant and warm, this cozy bedroom is marked by the presence of a beautiful comfortable bed, embellished with bedding in white and gray. The solid parquet reveals us its beautiful hexagonal shapes which merge with the exotic patterns of the oversized headboard. How about a cozy bedroom furnished in a romantic spirit? And if you plunge into a bucolic bedroom enhanced by a whole lot of soft cushions, pink pillow, bouquets of flowers and delicate curtains? Create a shabby chic interior and polish your decor with a mix of objects. The cozy shabby chic bedroom is modest in terms of color. Soothing hues, such as sky blue and water green, are favored and elegant solid wood furniture with an aged effect is put on. Original oriental style paintings and elegant furniture for a cozy Asian-style bedroom! 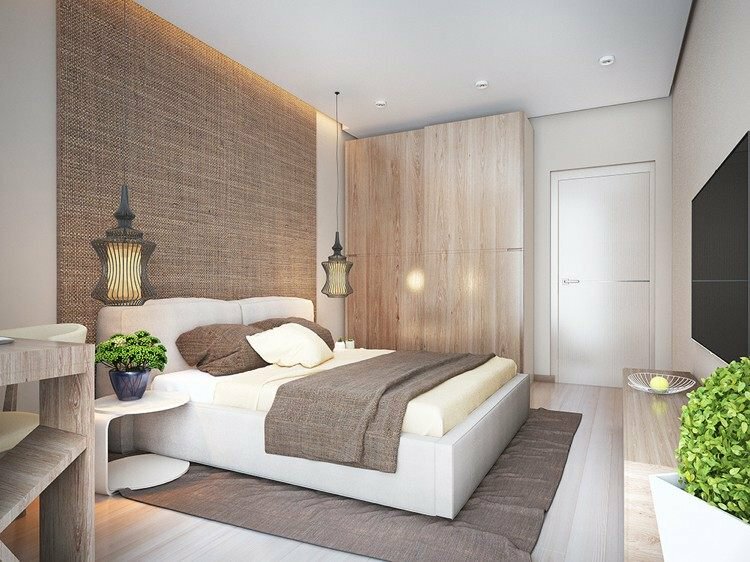 How about a cozy bedroom furnished according to the principles of Feng-Shui? Do you love Asian culture and would like to create a zen cocoon like Japanese homes? Master the harmony of colors – the key to a successful Zen bedroom! Side walls, bet on the duo timeless black-white introducing some accents to boost the interior decor. For more effect, do not hesitate to hang an original painting with oriental motifs or, why not, a Mandala mural! The cozy art deco bedroom is the ideal solution for all admirers of decorative art! How to transform the luxury bedroom into a super comfortable cocoon? The answer is very simple – we show it! We multiply the decorative objects, we embellish the floor with a soft carpet or a beautiful animal skin, and we install a nice suspension diffusing a soft and subtle light. As a general rule, the cozy bedroom supposes the use of warm materials and mineral colors. 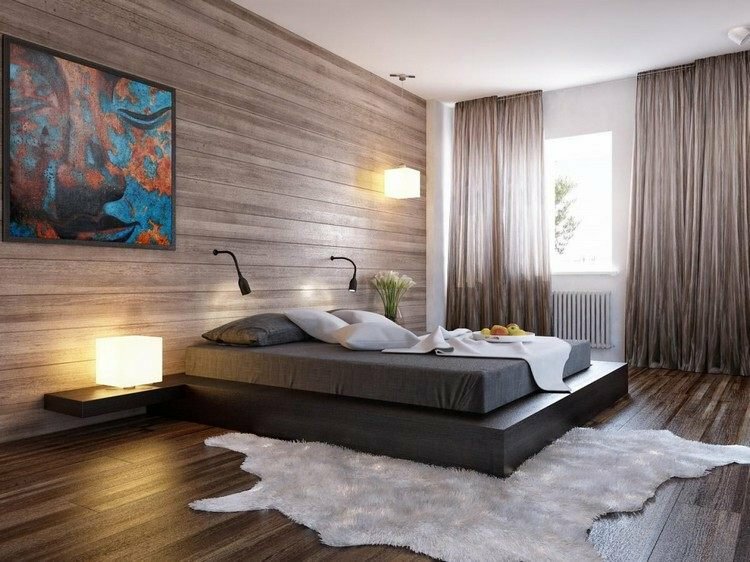 Like the blond wooden furniture, the furniture in dark tones has real advantages to boost the cozy character of the bedroom. That’s why we advise you to adorn your bedroom with furniture that alternates between dark shades and pastel shades. 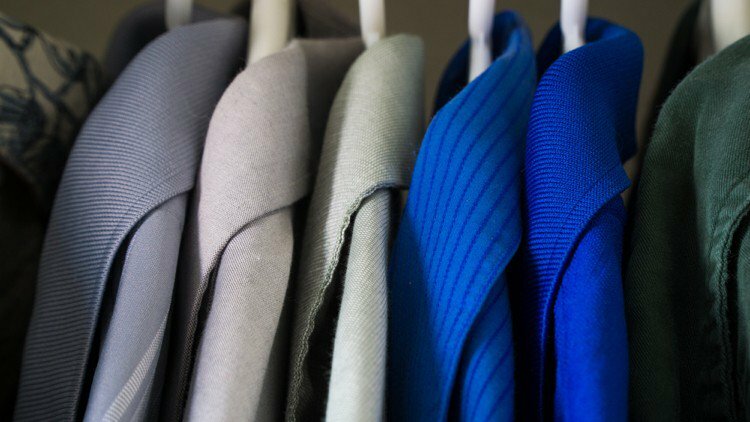 Store your clothes by color from light to dark! You wish to give the stamp to the decoration of your cozy bedroom? In this case, you can try to create a soft and soothing interior alternating between mineral colors and flamboyant shades. Multiply tables and rugs, and mix styles to further customize your decor!